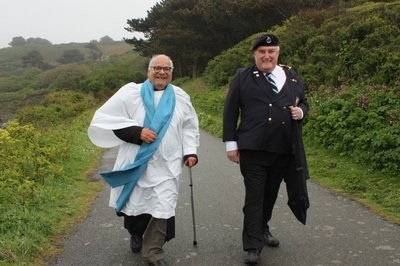 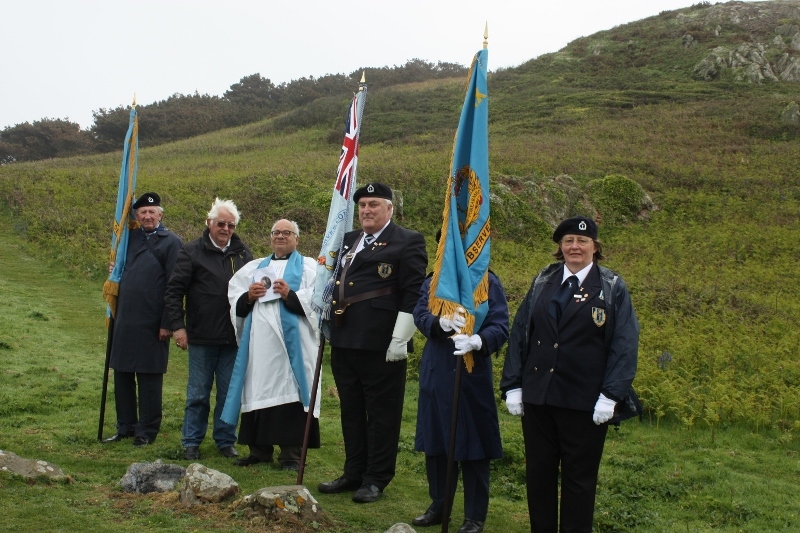 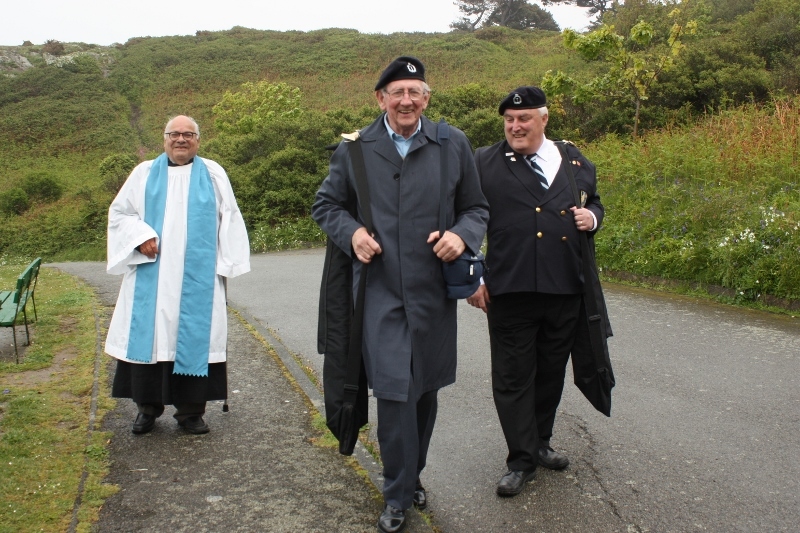 Channel islands Liberation Parade 2014 - Royal Observer Corps Association This website was set up in October 2012 and is the new official site for the Royal Observer Corps Association. 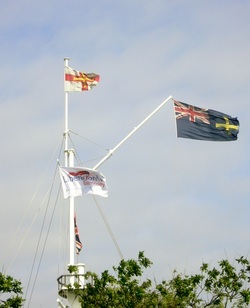 The Liberation Flag Mast at St Peter's Port. 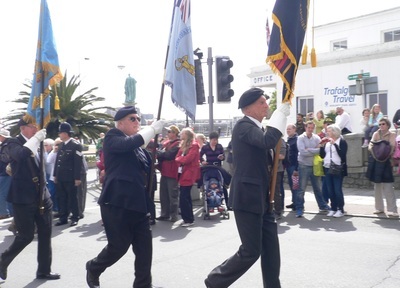 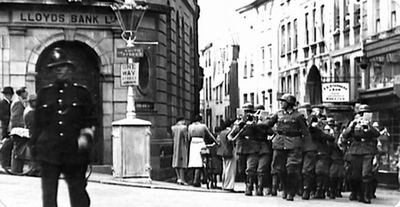 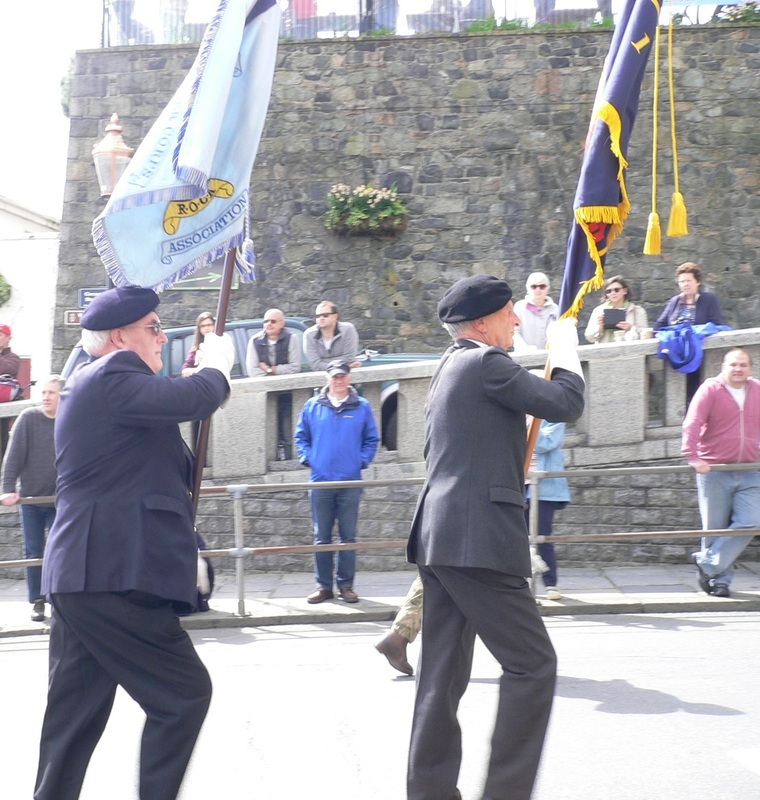 The Liberation Day parade in Guernsey – This year on the day before the Liberation Day parade (which was attended by Murray Whitcher every year from 1990, when 12 Group drill flight took part in the afternoon cavalcade, until 2013 without missing one), we had the honour as per his last wishes of spreading some of his ashes on the island. 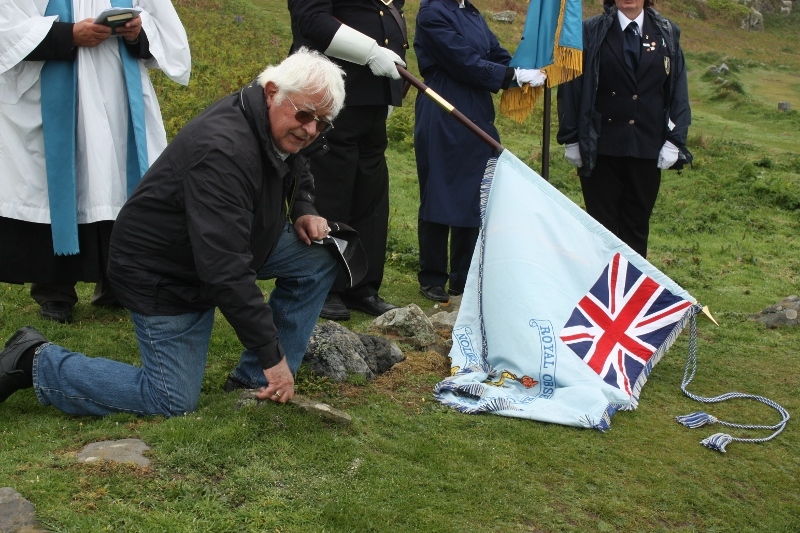 This was done at a spot that was special to both him and his late wife Joyce, and where, a few years ago, he had spread some of her ashes. For anybody who should be visiting the spot is at La Table des Pions, Pleinmont, also known as The Fairy Table. 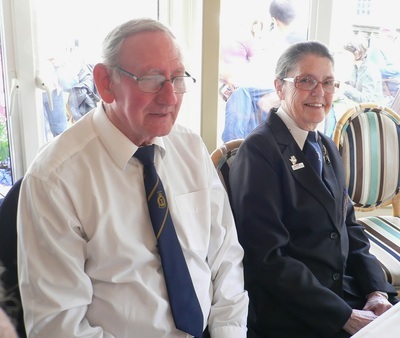 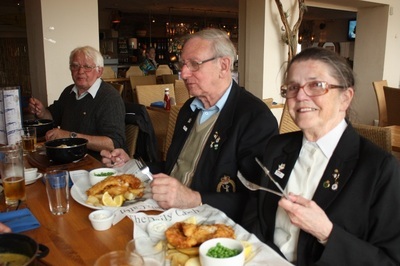 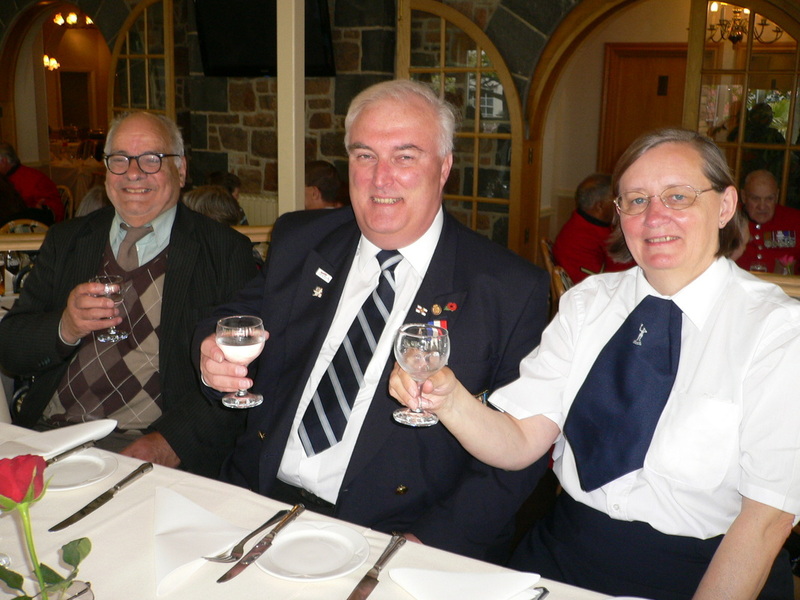 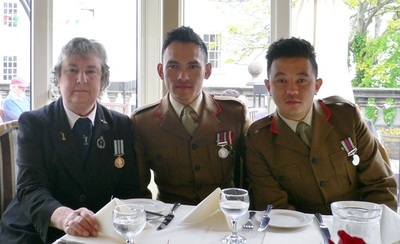 Special thanks must go to Hilary Daniel, who travelled over to Guernsey for the day especially for the ceremony. Despite the less than perfect conditions, a small service was held with both12 Group and 9 Group Standards, as well as the ROCA National Standard present. 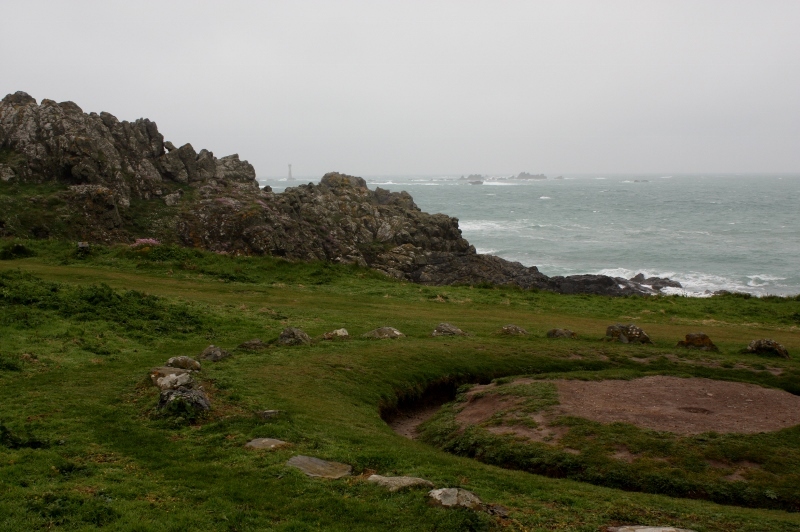 The pictures below show the scattering of Murray’s ashes, and the view from the site out to sea, with the Hanois Light just visible in the cleft in the rocks. 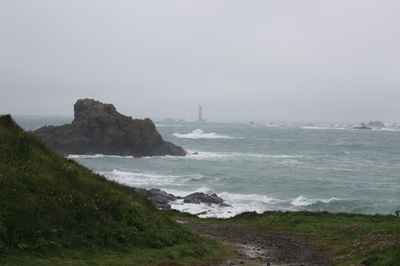 While that was a wet and windy day, fortunately the following day was bright sunshine. However the weather did have quite an effect on us. 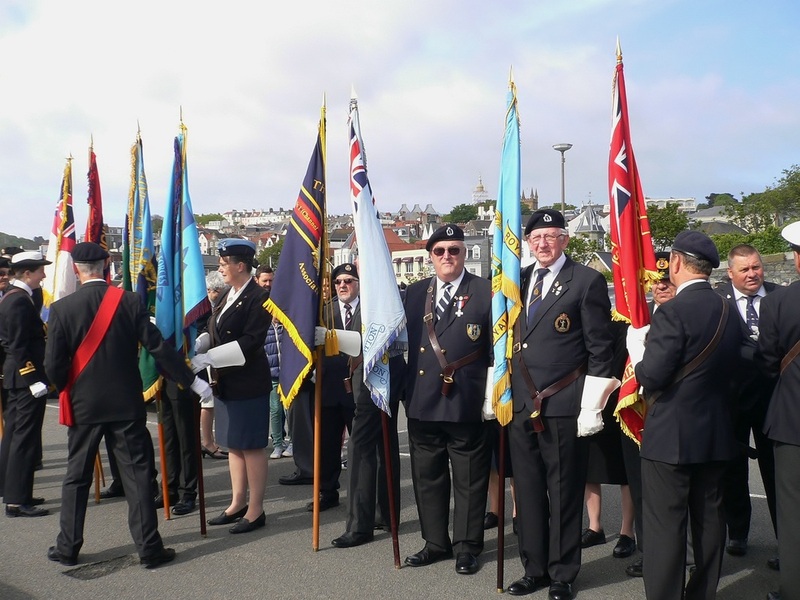 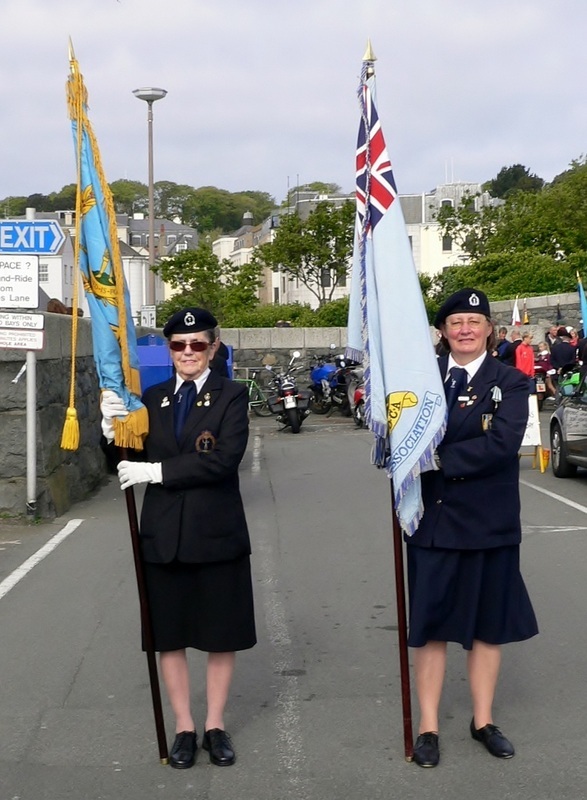 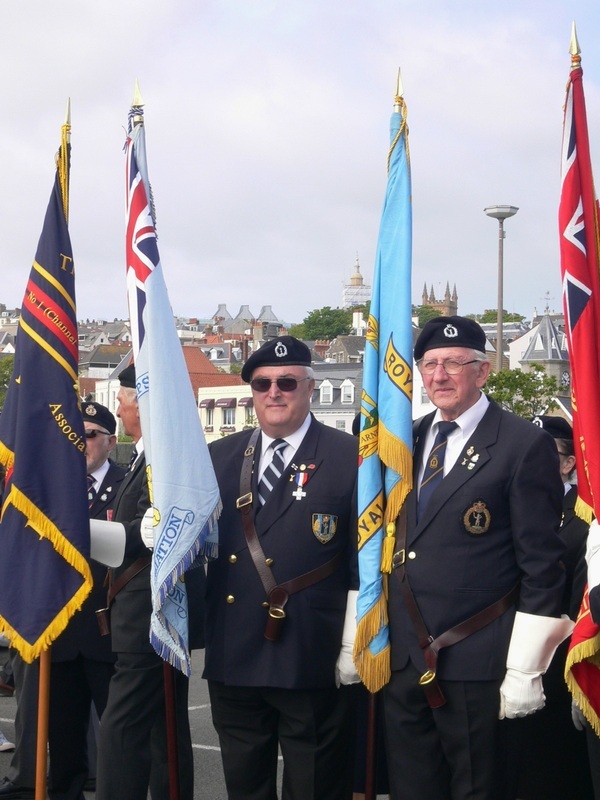 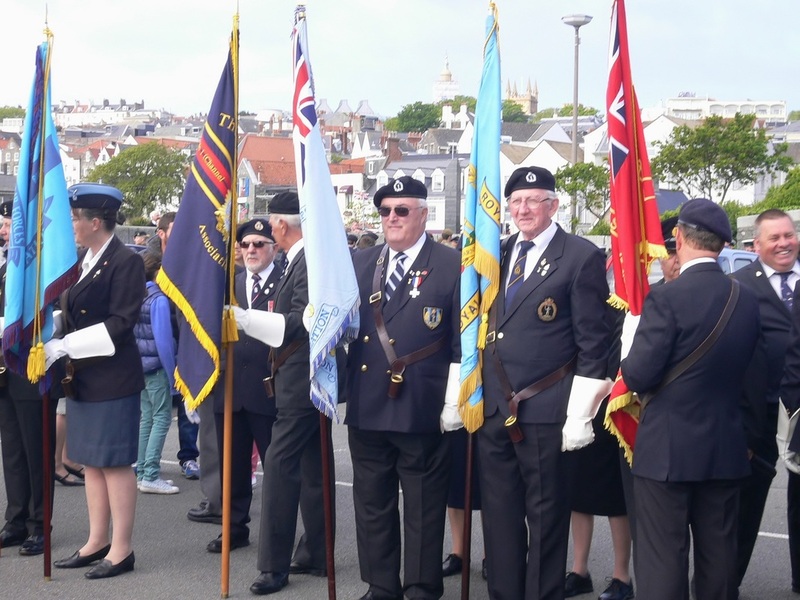 Photos taken on Liberation Day show us forming up ready for the march from the car park by the weighbridge, past the flag mast before the inspection by the Lieutenant Governor Air Vice Marshall Peter Walker. 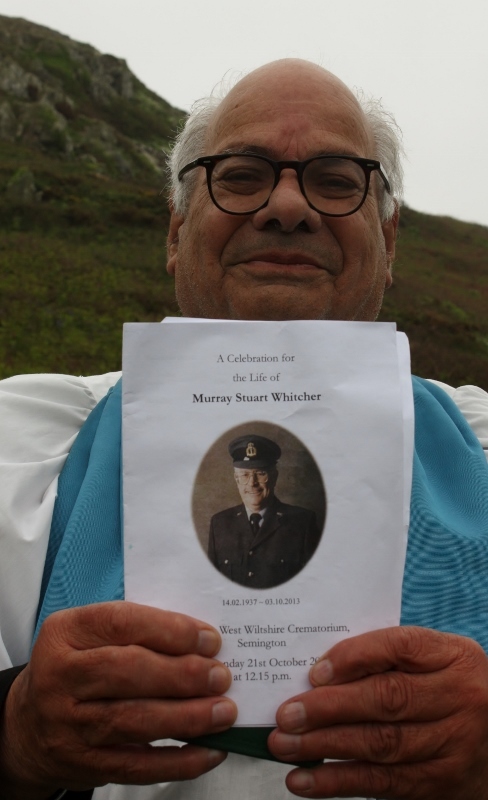 He was a former RAF pilot & remembered taking part in an aircraft exercise, where the ROC were plotting aircraft over the UK. 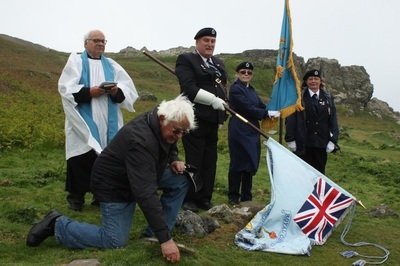 During the exercise an American 'enemy' pilot, tried sneaking down the Pennines. Peter Walker was waiting, somewhere off Scarborough, listening to the progress of the bandits and they arrived just when and where the ROC said they would.